The native portable version of PicPick (the ZIP archive) hasn't yet been updated to version 4.0.3, it is still 4.0.2. @giulia - if you are referring to the "creates an empty folder under C:\users\...etc," this began following V3.2.6. I have written to the author and asked that he allow the executable to search the main program folder for the app's INI file instead of insisting it be created under the User folder, but so far my request has fallen of deaf ears. I stick with V3.2.6 because I work on client PC's and they are not fond of my creating either registry entries or files and folders on their machines. If more people requested this slight change, I'm sure the author would listen. Confirmed and updated the entry. Thanks. I no longer use this application... not sure when this was introduced. Best is to email the developer to fix that. It may be available elsewhere too. You'll need to follow the extraction process above, checking the executable version for PicPick will tell you for sure this is v319. It looks like it based on the size of the installer, 12.3 MB, v320 is smaller, 8.7 MB. Version 3.2 brings the Windows 8 style ribbon interface, which I truly dislike. The previous version (PicPick version 3.1.9) was OK for my needs, and conformed well to my Windows 7 operation system, but I don't have any copies of it. Does anybody know where I can find the latest version (3.1.9) with the Windows 7 interface? Some useless FYI: The executable for 320 weighs ~900K more, hopefully the added code is worth it. The difference in installer size has to do with avgtb.exe, 320 has a much smaller file, 2.8 MB, 319 weighs a whopping 10.4 MB - really doesn't matter, it was removed..! Interestingly, 'picpick.org' points you to 'download.cnet.com' now, instead of 'nteworks.com/picpick' to download the installer - kinda annoying. I'm sure it's all part of the increasing adverstisement campaign so much freeware is forcing us to endure anymore. Also, the file size is much smaller, ~9.1 MB for 320, ~12.8 MB for 319, maybe just the compression, who knows, I've not tried to extract the latest just yet. I still like PicPick but as so many have complained about - the scrolling has been hit or miss, I've tried everything, read numerous threads, checked settings, in XP x86 w/ Firefox 8 thru 16 this feature has been disappointing. 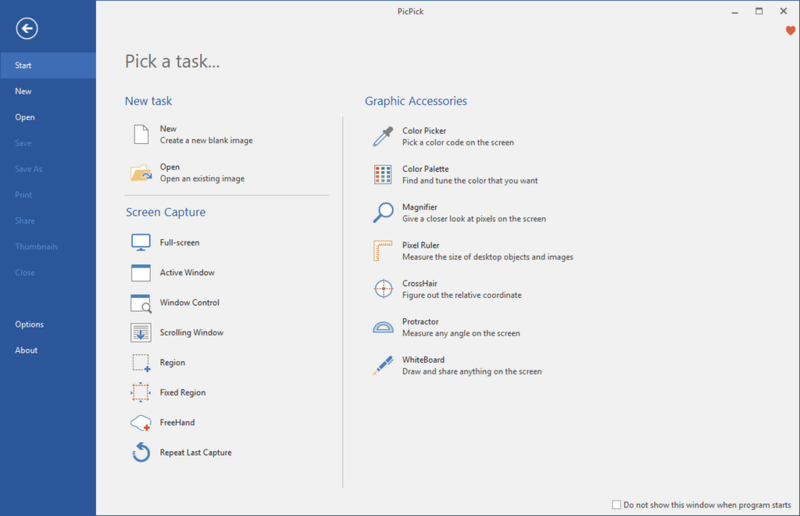 The interface has "modern looking" (Win 7) layout that shows all functions, easy to use. There's plenty of ways to capture an image. Has tons of non essential functions too -- A color picker, a MS Paint clone, a magnifier, a ruler and a freaking protractor! One of my Firefox addons appears to be interfering with "scrolling windows capture" feature and so it only captures the first part of the window (coincidentally the addon isn't actively maintained) Otherwise it's a very good feature packed screenshot program. can anyone tell me where (exact location) i can find this file? TIA. Sweet app, a rarely screen capture that support Unicode(only English character is not enough for me). But it have a problem with Kaspersky Internet Security's Sandbox, after run a application with sandbox, PicPick can capture Window Control, Scrolling Window, PicPick always target to a object name AVP.SandboxBorderWindow. I tried to capture with FSCapture but It doesn't have this problem, still work ok. Indeed. Which makes me wonder why Universal Extractor doesn't work, not even with an updated 7z.dll and 7z.exe. It extracts a 7.2 MB executable instead of a 10.8 one. There is no need to run the installer.... 7-Zip and Voilà! Thanks for the comments. Is the the Bing toolbar optional in the installer? 3.0.3 has yes different installer. But you may just run installer, copy files to your own location, delete saveappdata.ini and uninst.exe and then uninstall program. You have to install in Sandbox, then copy over the files. Or install in a Virtual Environment. As MarkB pointed out, V 3.0.3 does not work. Tested on W7-64bit. V. 3.0.3 doesn't run on my XP SP3 system. I returned to v. 3.0.2. I noticed the the new executable is a lot smaller than the previous one, which I thought was good initially. But perhaps the author forgot some code ;-). There seems to be a glitch with the 'Full Screen' capture Hotkey. It keeps reverting to 'PrtSc'. now the hotkey will save with your setting. I think this screen capture program is the best software I've ever tried =) ! 1. ability to retain images after capture! FSCapture deletes the old capture with no option to enable Tabbed View or Cascading Windows. It is very annoying. I have to capture, then save right away or the image is lost. Still an excellent program, but in danger of becoming bloatware. I don't know where my previous comment went (the one I posted as "administrator"), but it just said that the $PLUGINSDIR directory should also be deleted, for those who may be confused. Missing a step on "how to extract": you need to delete the "$pluginsdir" and "$temp" directories. Because it's not freeware anymore i stopt using it (don't use it that much anyway) and started using GreenShot, free and open source. Does write settings in Application Data folder so not portable but who knows in the future. I like the functionality of picpick alot; it has a nice assortment of tools, but I have abandoned it for ScreeshotCaptor (from DonationCoder) because PicPick is so very slow to act. You hit the hotkey and then wait for 30 seconds before it does anything; I have this problem both with the portable and the installed version. It has almost all what I need except one thing that I can't not typing unicode by the text tool. Thanks the authors of this program. Absolutely TOPS in screen capture utilities. 100% portable and FREE as well! A great AIO tool for portable flashdrive. Easily compiled to portable using another freeware called FilePacker. By using the option to expand on the host computer instead of the flashdrive, and then delete PicPick after closing, all residue is deleted from the host computer. That way you can keep your flashdrive 'write-locked' against virus/trojans. gotta disagree with webfork, clearly NOT the best image capture program on the site, get fscapture instead. Supports all these features + capture contents of a scrolling window, also has its own built in image editor so no copy from clipboard rubbish. Works great - even on Windows 7 - I just wish the program would open the clipbaord in the Image Editor automatically - why have an extra step where you select : "File > Open from clipboard" ? I've found that the PicPick tools do not work on auxiliary monitors. Is there a work around? Perhaps "good," but certainly not "great" or even "best." This program has known issues and is only portable-lite. See the problems discussed in this toopic at TPFC forum at http://www.portablefreeware.com/forums/viewtopic.php?p=18299 . The same problem is discussed on the software's forums. The best portable image capture program on the site: easy to use, feature-rich, and fast. Much more than just screencap and color picking software with a variety of cool features for Web Developers.